Do you ever make mistakes when you’re working in your journal? Or doodling? Ever put down a wobbly line? Smear some ink? Drip watercolor where you didn’t mean to? How does it make you feel? Perhaps a bit aggravated or disappointed? Do you ever want to tear a page out of your journal because it isn’t pleasing to look at? On the other hand, I have come to realize that many of my favorite artworks—and definitely many of the ones that were “breakthroughs”—arose from mistakes and the struggle to “salvage” them. 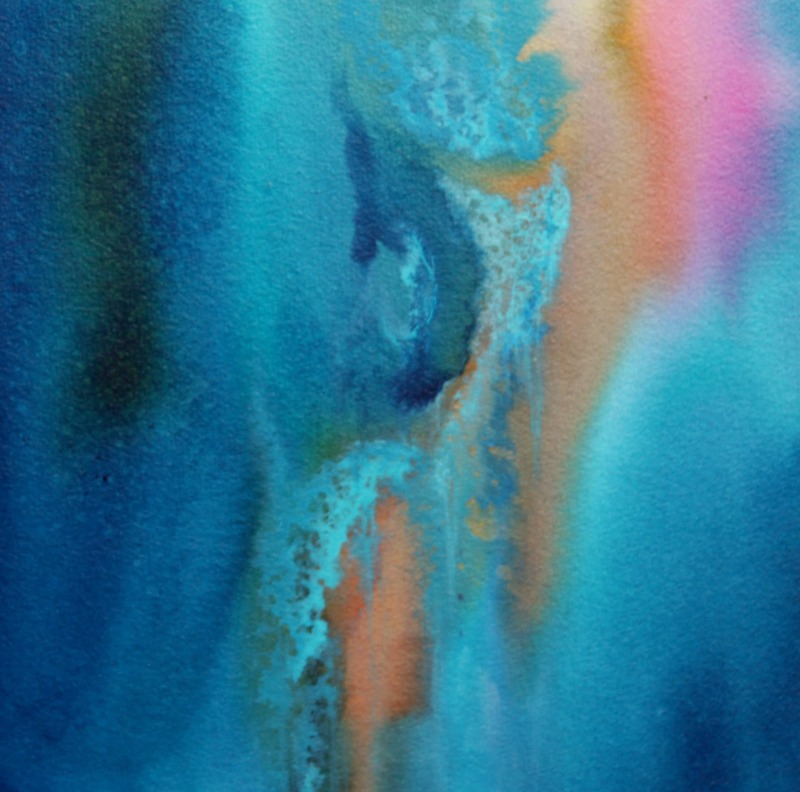 One of my favorite pieces from the 30-paintings-in-30-days challenge resulted from a mistake. This painting emerged from a “failed” landscape. What is a “mistake” in art? In some areas of life, a mistake can have pretty serious consequences. An injury, a financial loss, a relationship strained, a cherished possession damaged. But in art-making? Not so much. In art, a “mistake” is the name we give something unexpected and unintended that we’re not sure we like. What happens if you make a mistake in a doodle or a drawing or a painting? It doesn’t blow up in your face. No puppies suffer. The only thing that might implode is the plan you had for the piece. But, maybe what you are calling a mistake is the voice of Spirit, of the universe, of chaos, of the Trickster, of your subconscious . . . telling you to lighten up, reconsider from another perspective, break out of a rut, let go, wake up . . .
Maybe it’s the challenge that will bring you a bit closer to clarity or understanding. Maybe it’s a doorway to mystery and wonder. Maybe all we need to do is embrace our art “mistakes”, let go of ego and fear, let go of whatever plan we were clutching so tightly and enter into a dialog with the materials to see what might emerge. Maybe we just need to wrestle with our mistakes, for what the struggle teaches us. Maybe they’re not mistakes at all. Maybe they’re genius in disguise, if only we can find the way to work with them. The tan color in the background of this painting was an accident, but the piece that resulted is one of my favorite paintings.